Reston, VA – In conjunction with the Northern Virginia Fine Arts Festival on May 21 and 22 at Reston Town Center, ArtInsights has the worldwide exclusive premiere of images from The Art Outsiders by Tennessee Loveless. The Art Outsiders is a portrait collection of important and influential creators who, through their struggle and determination have changed the world with their unique genius. 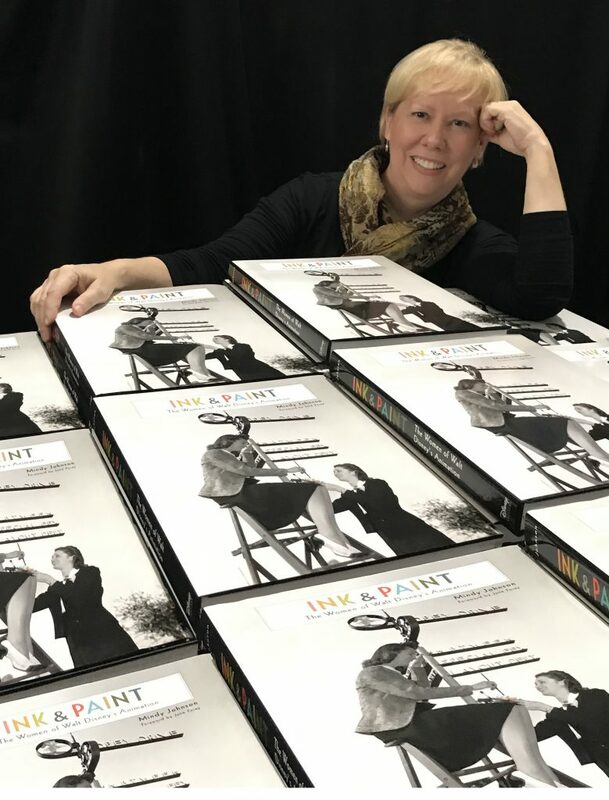 The Chicago-based, internationally known artist will be making a personal appearance, 2:00 p.m. until 4:00 p.m. on Saturday, May 21 and Sunday, May 22 at ArtInsights Gallery, 11921 Freedom Drive, Reston, VA. 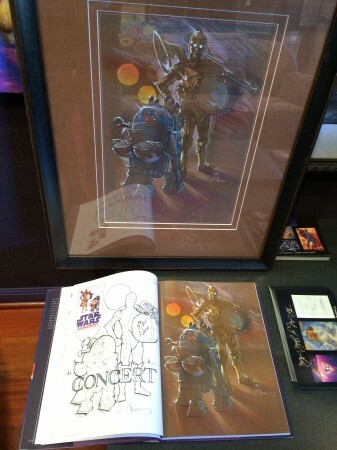 The display of his original and limited edition art will continue as the collection expands, and as sales allow. As always, gallery admission is free. For more information, contact ArtInsights at 703-478-0778 and visit HYPERLINK “http://www.artoutsiders.net” www.artoutsiders.net. 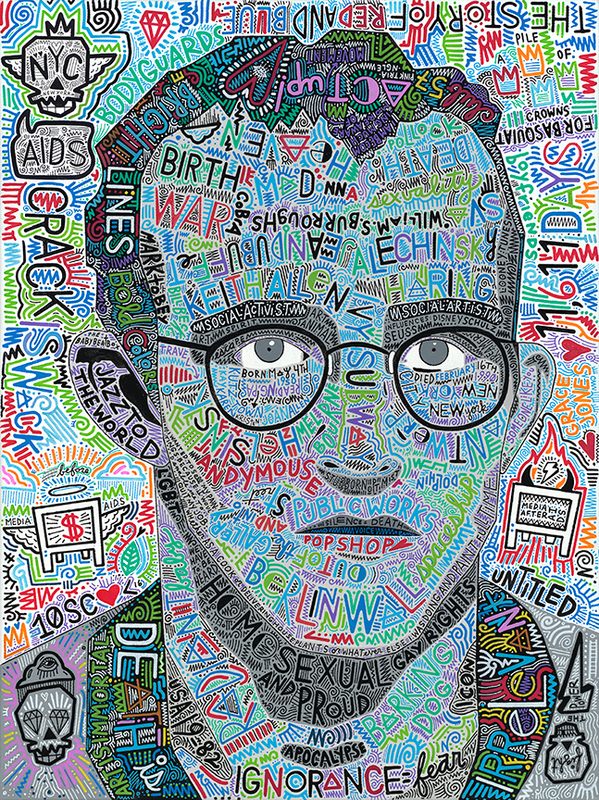 The first seven images of the series, which are part of a growing list of over 40 names, include Divine, Van Gogh, Coco Chanel, Andy Warhol, Keith Haring, David Bowie, and Judy Garland. The Art Outsiders Project is a collection of portraits of people who were outsiders of their own field of work. From science, music, art, writing, fashion, and beyond, Loveless is writing the stories of each outsider’s life, and imbedding it into the structure of their portrait. The pieces act dually as portraits and stories, and all of them combined will talk about persevering through the darkest times to create a different kind of beauty that changed and continues changing the world. 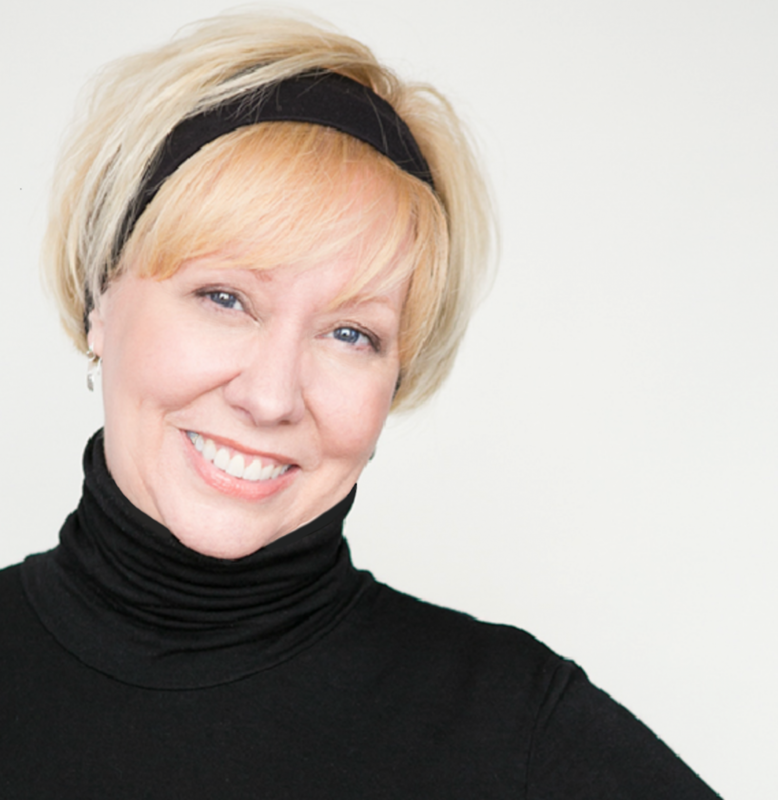 His fine art representative and partner in The Art Outsiders project is ArtInsights owner Leslie Combemale. From her perspective, the fact that Loveless is colorblind and limited in his ability to see color, is a fascinating after-thought in considering Loveless’ unique talent and artistic voice. “Tennessee’s art comes from his entire being, and his life experience. It’s true he has had to choose colors based on psychology rather than a personal visual understanding, but that is only one aspect creating the unique depth of his images. 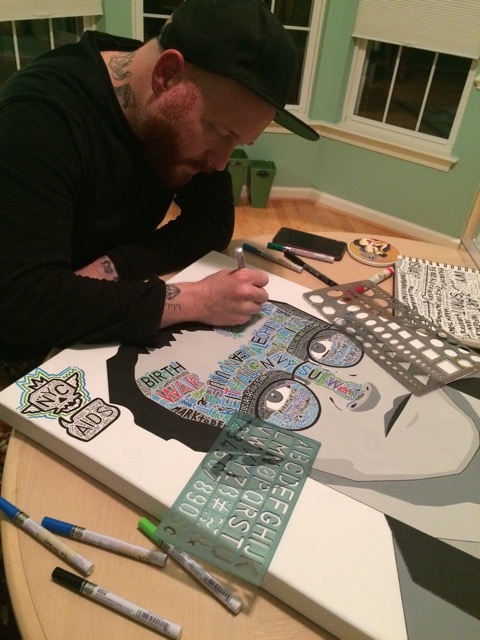 For The Art Outsiders project, for example, he is entirely immersing himself in the lives of the artists he is painting. He is speaking to their struggle, importance, and relevance. I’m thrilled it’s being so well received. People either love or hate his art, and I think that’s a great sign! It’s true for all iconoclastic contemporary artists”. 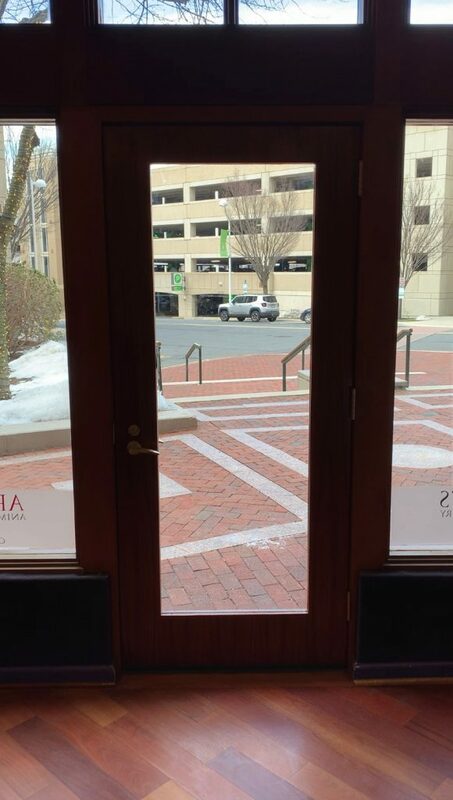 ArtInsights is a privately owned gallery located just outside Washington DC at 11921 Freedom Drive, Reston, Virginia, in Reston Town Center. In addition to their focus on the art of film, the gallery is displaying the work of The Art Outsiders project, which is a partnership between Tennessee Loveless and Leslie Combemale. Open since 1994, and co-owned by Combemale, ArtInsights is expanding to allow the display of the contemporary work of artists and art projects represented by Combemale Creative, her company for international art consulting and artistic representation. The gallery has Loveless’ Art Outsiders art as well as representative art from his entire career, including drag queens and 10x10x10. Visit ArtInsights at HYPERLINK “https://www.artinsights.com/” www.artinsights.com. For more information about The Art Outsiders project and Tennessee Loveless, visit HYPERLINK “http://artoutsiders.net/” artoutsiders.net. Happy Birthday! The Mickey Mouse Club turns 60! The series began on October 3rd, 1955! My own personal experience with the Mickey Mouse Club is with the cels from this series. 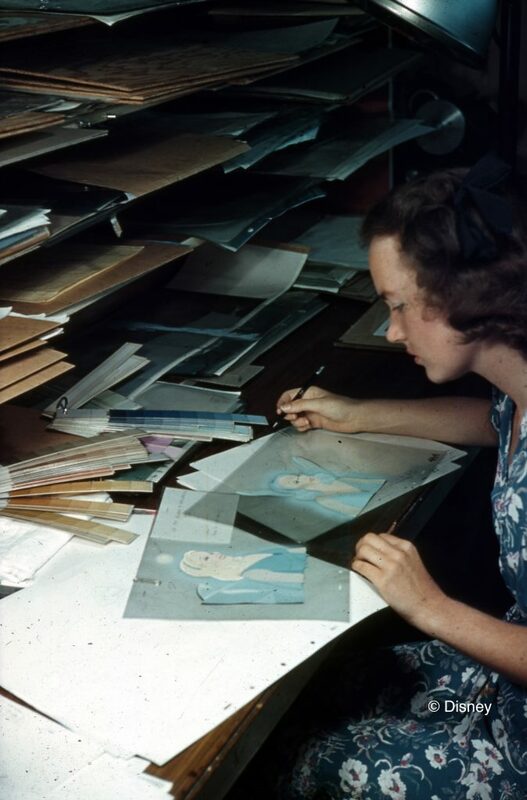 Also, most of the cels were sold originally through the Art Corner, a store in Disneyland where they sold original Disney art from 1955 to 1966. This means the cels were cut down to a smaller size, matted, and came with a seal on the back. A very recognizable seal! Many of the cels from The Mickey Mouse Club and indeed most that were sold through the Art Corner are stuck to their backgrounds. It’s inherent to the era. If you find a cel that isn’t, it’s probably been completely repainted. One of my favorite stories from my long history selling animation art is that a friend of mine who is a chemist and also a collector discovered a way to remove the cels from their backgrounds without ripping all the paint off the back. When he told me he’d actually done it, I felt like he’d made a major discovery. That’s how Disney geeky I am! So now when we have cels from that time period lots of them are NOT stuck to the backgrounds because we get them all from this one awesome guy. 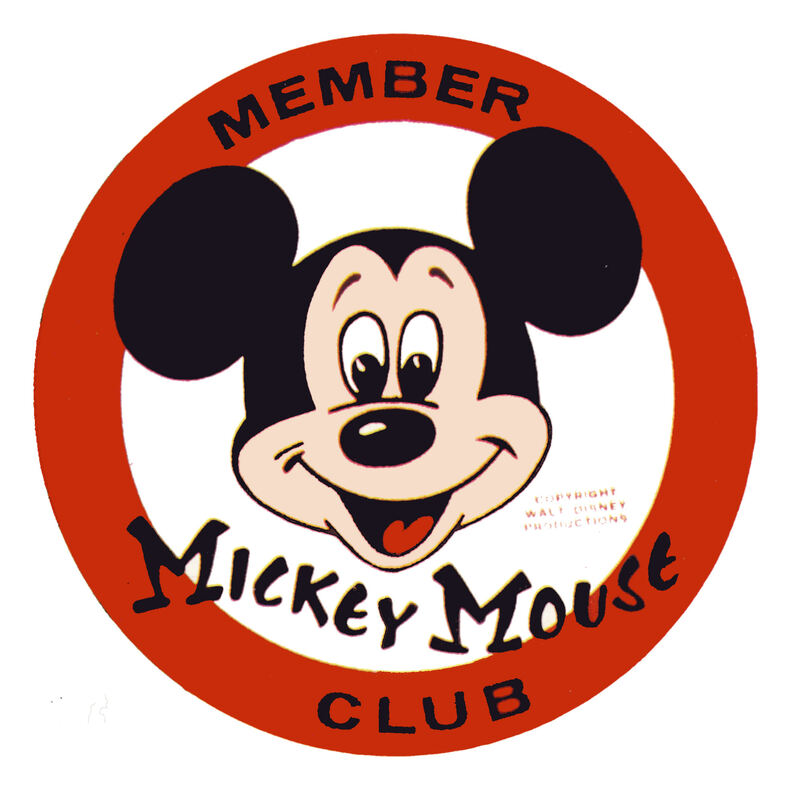 My personal history with The Mickey Mouse Club is probably in some ways similar to many, at least those from other parts of the world. I saw it was coming on (in reruns, of course) in Paris on TV and I begged my parents to let me watch it. I didn’t care. And actually there were plenty of animated moments, certainly enough for an 8 year old. What I didn’t know, because they didn’t play them that way, was that each day of the week was specific to a particular subject. I learned that later, as an animation gallery owner! 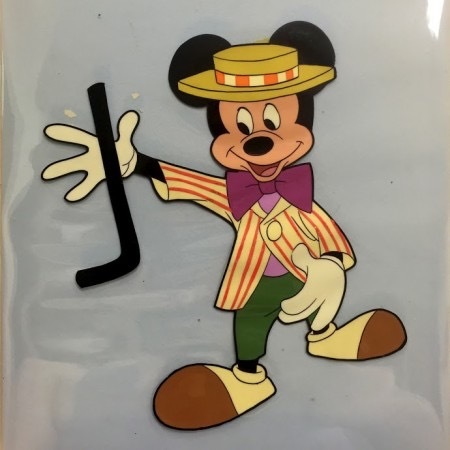 I love, though, that collectors who remember or have a love for The Mickey Mouse Club can get cels of Jiminy Cricket (that also have a thick ink line) and a bunch of other beloved Disney characters for much less than if they had bought them from the original features from which they originate. 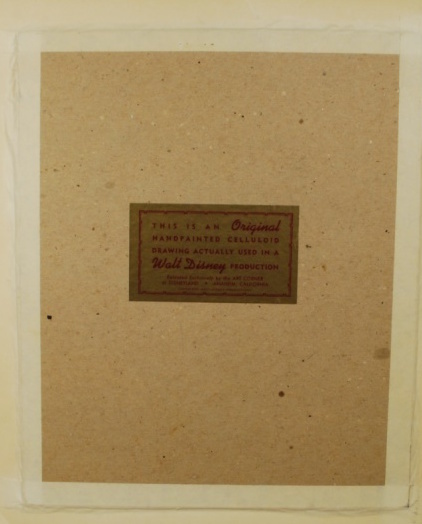 Mickey Mouse production cels, original and limited edition art are going to have a resurgence, and soon. Why? There’s a new Mickey Mouse show, which began in 2013, and to date it’s seen in 160 countries, translated into 34 languages. The show is making Mickey cool again. Still, purists will always look back to the early cartoons of the late 1920s, the Sorcerer’s Apprentice, and The Mickey Mouse Club. On this 60th anniversary of their premiere, we owe thanks to a show that made Mickey Mouse himself, his pals, and the live action kids so relatable to children all over the world. 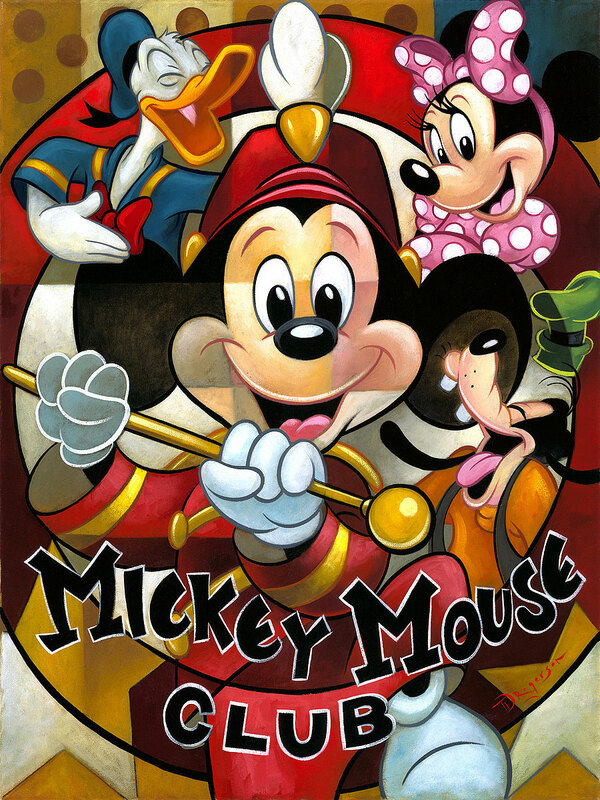 For all the Mickey Mouse art ArtInsights has available, go HERE, and of course for commissions or requests for particular images, contact the gallery! 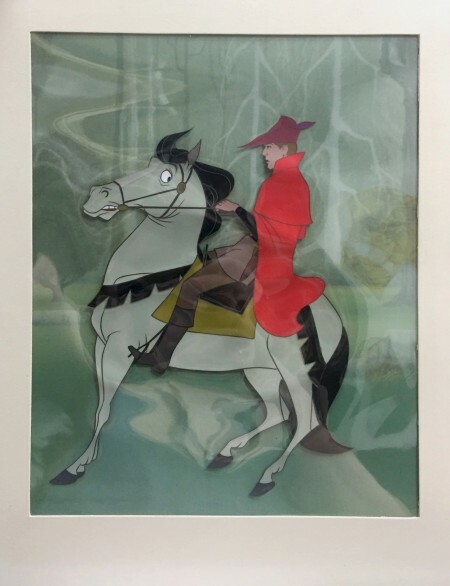 Sleeping Beauty Production Cels: Why is original art from Sleeping Beauty is so beautiful? 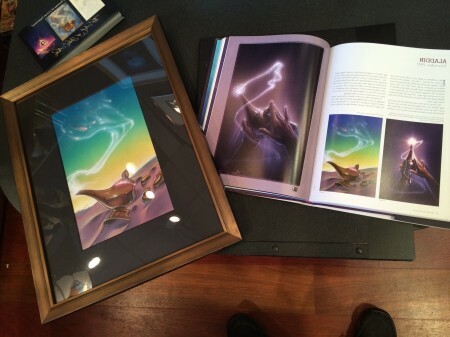 In the course of my career selling animation art and advocating for the value of animation art as a legitimate art form, i’ve discovered collectors of original production art, and even Disney interpretive art, tend to gravitate to movies that are either firsts or lasts. Sometimes they are aware of the history, and sometimes they are responding to something they feel or see, not knowing the technical or historical reasons. For example, there are lots of Snow White lovers, not only because it is the first full length feature for Walt Disney Studios in 1937. 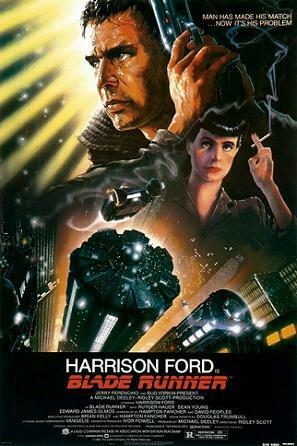 Few dispute that it is a masterpiece of invention based on a great old story, that is very important to the history of film. 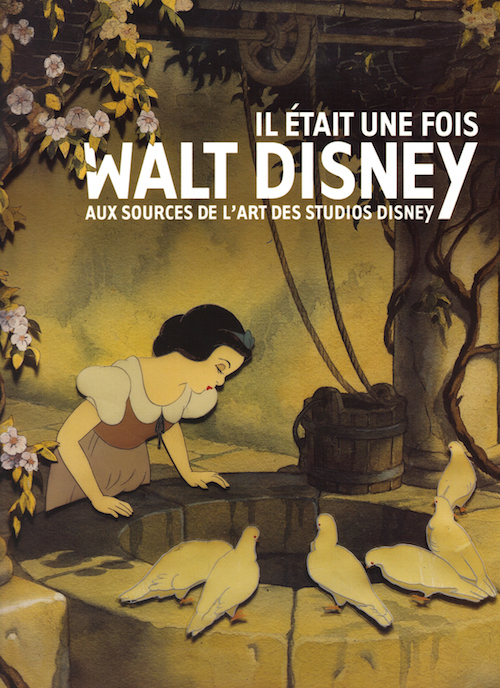 The fact that it is the first for Disney feature animation, though, means at the time there was a huge amount of experimentation and innovation. 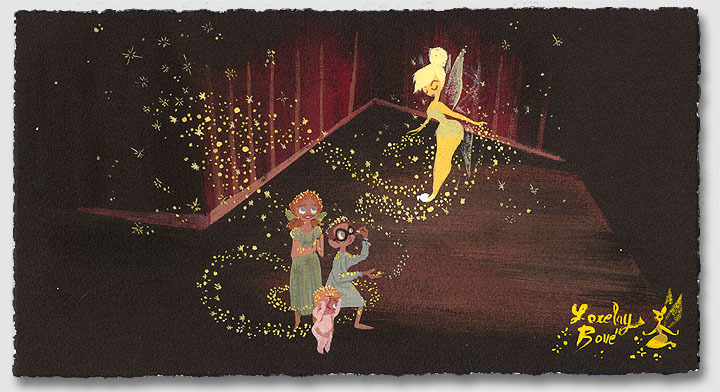 Character design made leaps forward, so that meant the villain, the Queen and her disguise, the witch, the dwarfs, the animals, and Snow White herself were full of little design elements that made the cels used to animate them fun to look at. The way the outlines of the characters on the cels were hand-inked, and the airbrush used to enhance the look of movement or “alive quality”, inadvertently made the production cels beautiful pieces of art. 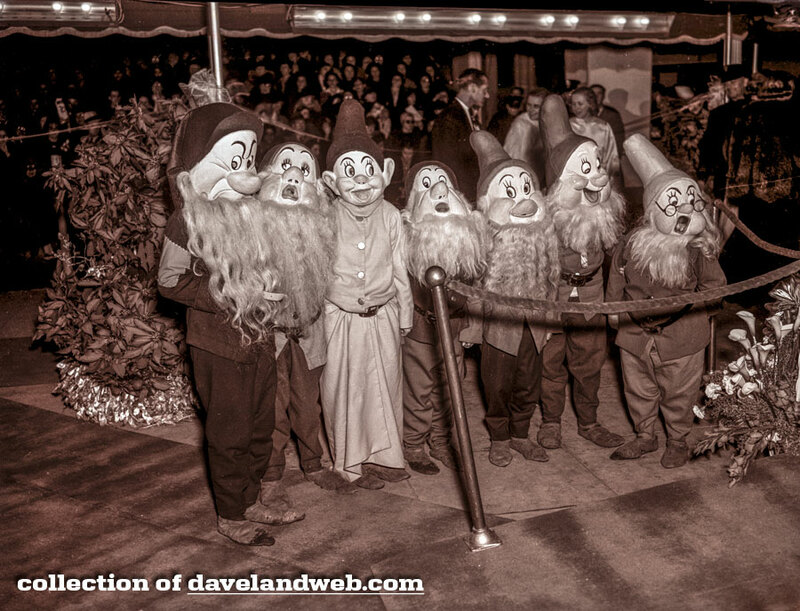 Of course Walt figured that out and sold them as art at the movie’s premiere. Although not the masterpiece Snow White is as a film, 1959’s Sleeping Beauty also has a slew of collectors and fans, and deservedly so. It is the last hand-inked feature film in Disney’s history. For that reason, the studio both went all out in their use of ink colors and enhancements, and experimented with the new technique of xerography they hoped to use in their next feature, 101 Dalmatians being released in 1960. For those of you who don’t know, xerography copies the original drawing onto the cel with a machine, making hand-inking the outline of the characters unnecessary. This took far less time, but also, they argued at the time, assured the integrity of the artists’ finished drawings, because they would be transferred exactly as they were drawn, onto the cel. Here’s the thing: Hand-inking, on animation cels, is just lovely. What I tell people who are wondering through ArtInsights for the first time curious to learn a little about production art, if you stand back and look at two cels, one with hand-inking, and the other with xerographic line, the hand-inked cel pops right off the wall. You can see the character so much better! The character’s outline being so clearly defined, and often in a variety of colors, adds dimension to the character itself. The problem of course, is that if you love 101 Dalmatians, you have to embrace the first that was using xerography to outline all the characters in the movie. To be fair, it has its own retro charm. 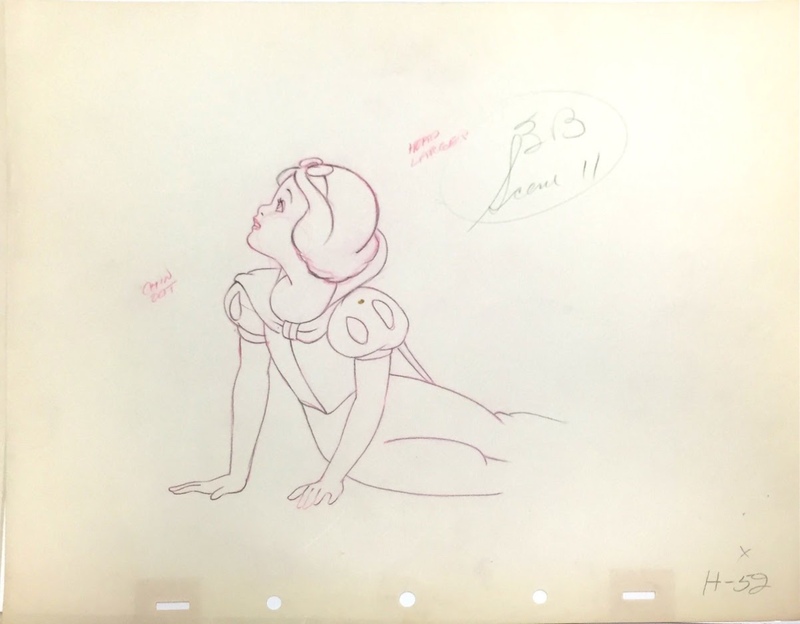 However, one of the reasons collectors of Sleeping Beauty are so committed to that film is because the hand-inking points to the end of an era, and as such goes out in a blaze of glory, and the cels are flamboyantly hand-inked to the point of artistry. I think the character designers and inker painters knew it would be the last time they would make such a strong mark on an animated feature, and they just put all their heart and soul into the art. Sleeping Beauty fans love the film for lots of reasons. The voice talent is extraordinary. 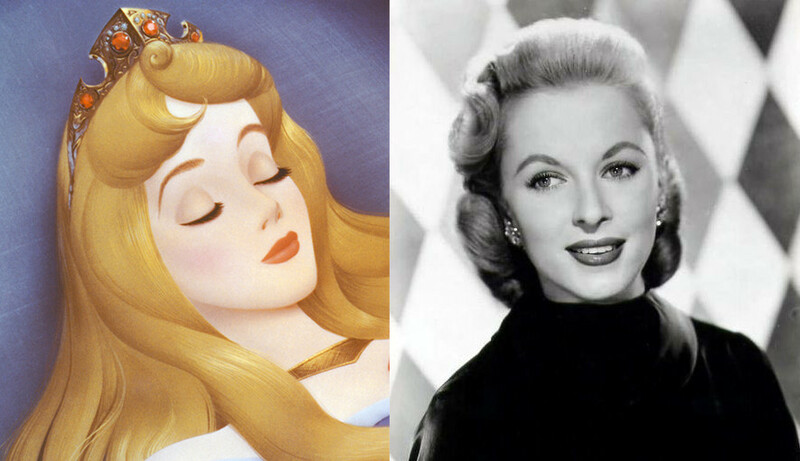 Mary Costa as Princess Aurora was wonderful casting, because she could bring her background as an opera star to the experience. Vera Felton, at this point a Disney veteran, having been tapped for the fairy godmother in Cinderella and the Queen of Hearts in Alice in Wonderland, among others, voiced Flora. 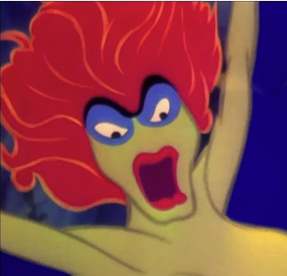 Radio voice star Eleanor Audley had voiced Lady Tremaine in Cinderella, and absolutely rocked it as Maleficent. That character is beloved not just for her design, but certainly for the way she was voiced! The animation artists involved in Sleeping Beauty point to a particularly fruitful time at the studio. The character animation is some of the best in Disney history. Marc Davis animated both Princess Aurora and Maleficent, Milt Kahl worked on Prince Philip, Frank Thomas and Ollie Johnston handed Flora, Fauna, and Merryweather, and Wolfgang Reitherman worked on the dragon. For those of you who know these names, that’s a lot of Disney genius in one place. 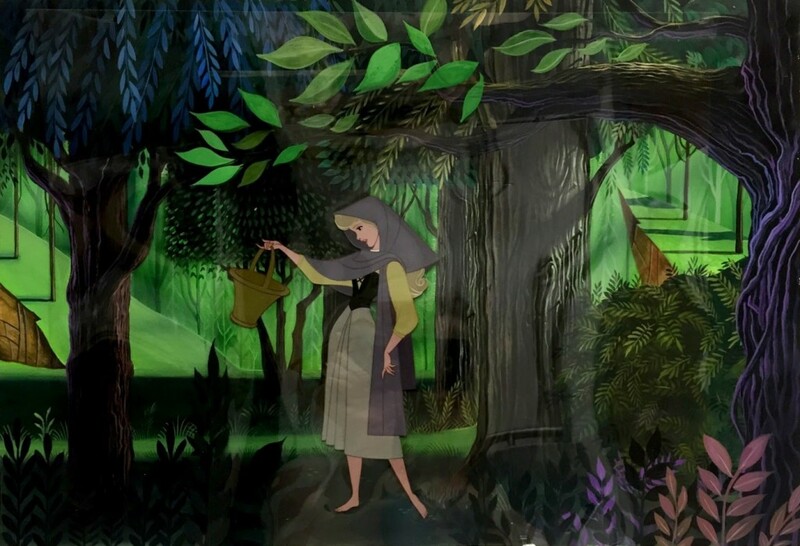 Eyvind Earle, Sleeping Beauty’s art director, was known as a masterful background stylist, and invented much of the look of the movie’s backgrounds, especially the ubiquitous mid-century modern trees, modeled after those that surrounded him living in California. 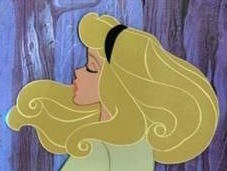 Though Sleeping Beauty didn’t succeed at first at the box office, it has since gone on to be seen as one of Disney’s best. Not that animation collectors who search avidly for good production cels from the film care about such things…they can’t be convinced by nay-sayers because the cels themselves are just so gorgeous. A Disneyland art corner original production cel of Prince Phillip and Samson we just got at the gallery. Are her eyes open? Does she have her basket? Can you see the curls in her hair? (hand-inking at its best!!) Is she full figure but you can see her face well and she has a good expression? Are there animals present? Is she dancing? Is she dancing with the prince? (unlike the end of the movie, that would be comprised of, in this scene, two cels, not one with both of them on it like the ‘dance among the clouds’) has the art been restored? 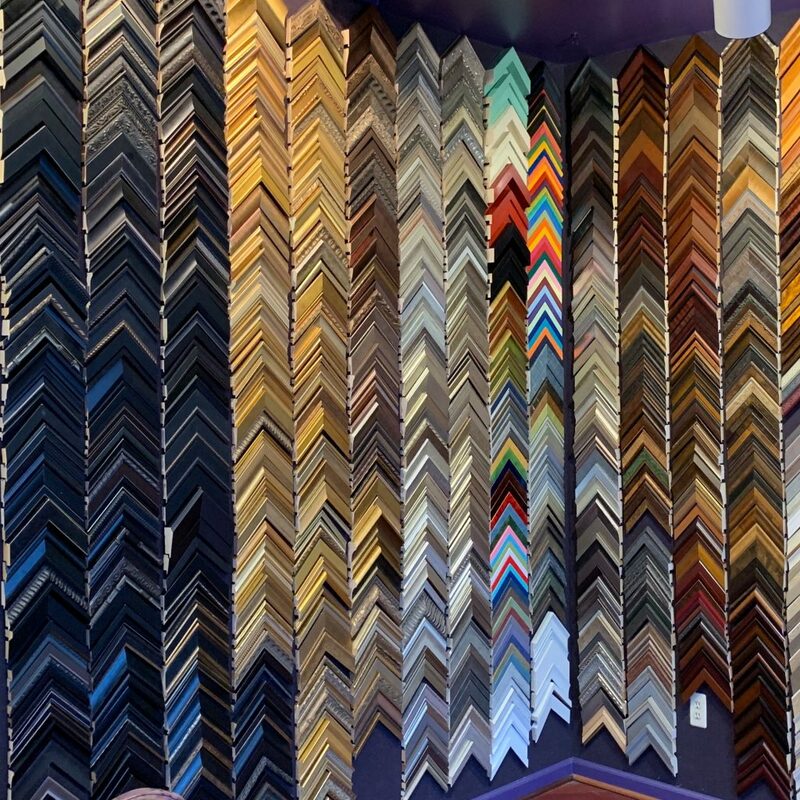 (I try not to sell restored art) is it in a hand prepared background? Is it a full cel or is it an art corner piece? 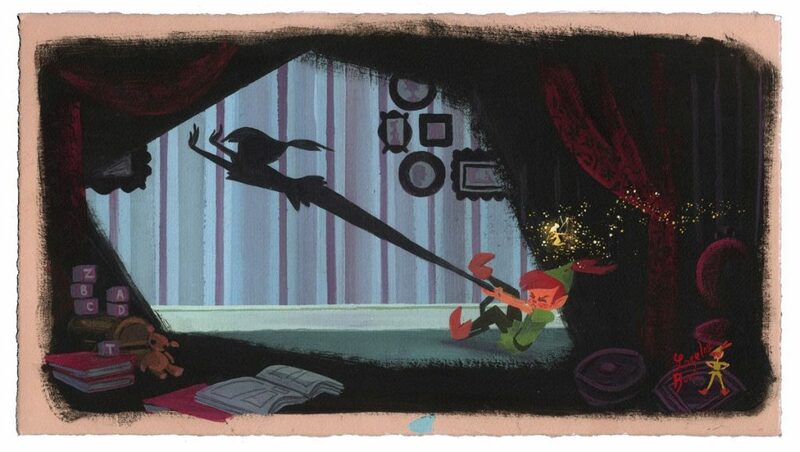 The Sleeping Beauty production cel we have right now has a hand-prepared background on it. 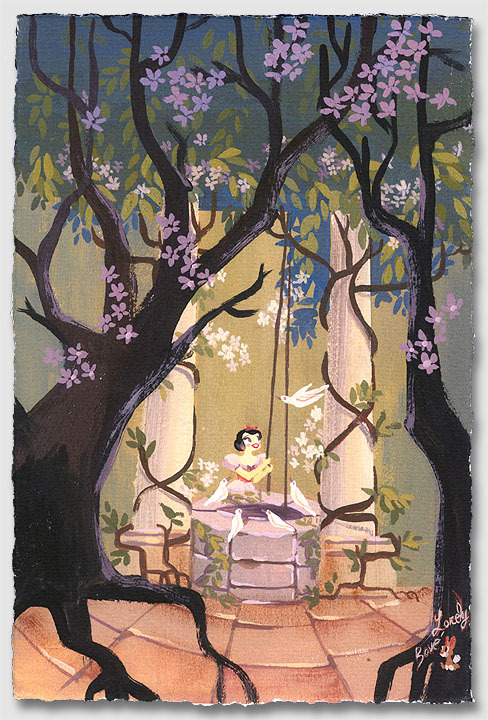 Created by an artist who has worked at Disney, this artist captured the essence of Eyvind Earle’s style. So much so, that i’ve been afraid about making sure the provenance stays intact and should the art ever leave the hands of whoever I sell it to, it is clearly indicated that this is NOT from 1959. It helps that this artist created the background on archival mat board and it has a repeated stamp all over the back CRESCENT, CRESCENT, CRESCENT! 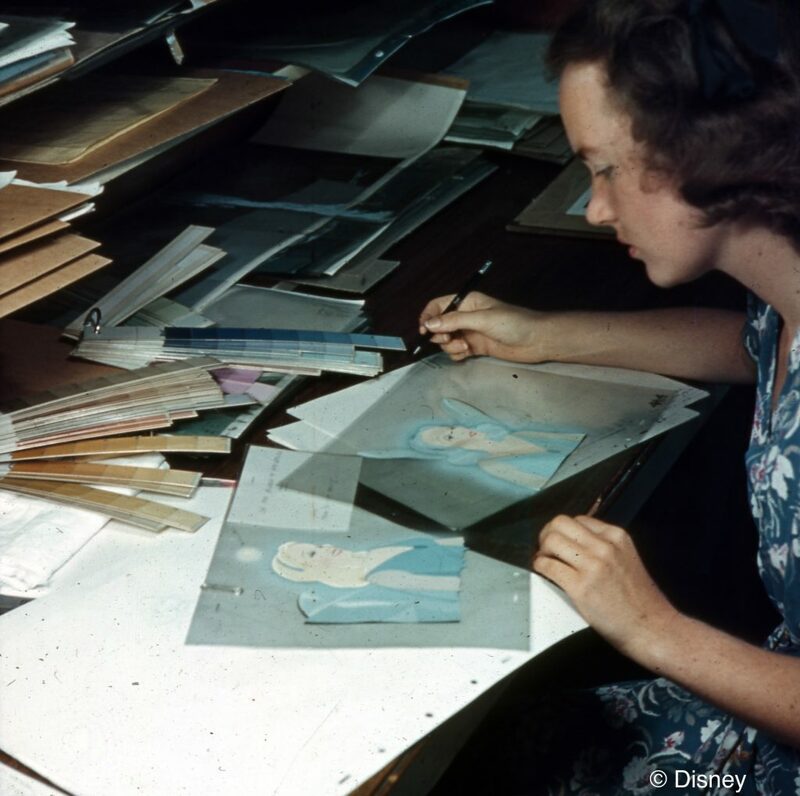 (the company that makes those mats) The cel is unrestored, and yes, you can see her hair. 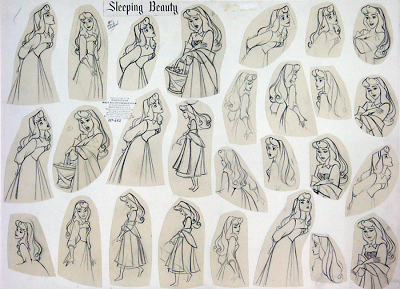 For my part, Briar Rose cels are some of my favorite production cels because of her hair. Realize, now, that her hand-inked hair is done 24 cels per second through the entire movie. THAT’S CRAZY! No wonder they switched to xerography! One of my favorite parts of my job being a gallery owner is finding original cels that truly capture the spirit of a character. Knowing that production cels were photographed and used the create the film, a film that has been seen by many millions of people, just brings me such joy. 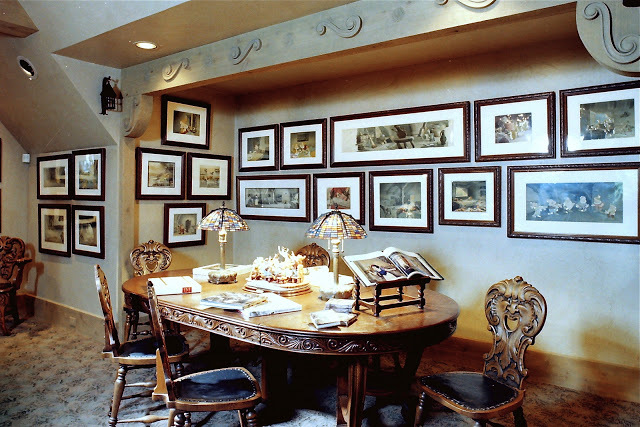 It’s like animation history, and indeed art history, in your hands, or on your walls. It also brings me joy knowing there are like-minded people out there who also love animation art. Being in the industry since 1988, I saw a time when few knew what the heck it even was! 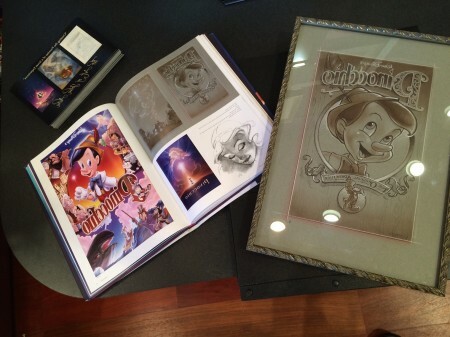 I still have people who come in and think it’s all kid stuff, but I hope with blogs like these I can change a few minds, or reaffirm the love of cartoons and animation art in a few collectors, and even more Disney lovers! For ArtInsights, i’m Leslie Combemale. These are just thoughts and musings of a gallery owner and lover or art and animation. 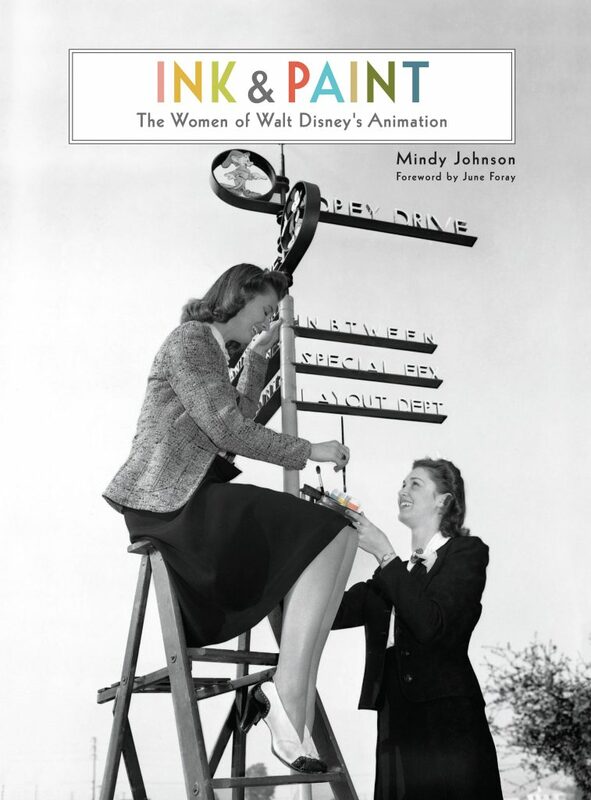 There are lots of books that will go far more in-depth about the history of animation and Disney. Please feel free to ask questions below or email the gallery if you are looking for Sleeping Beauty art or animation film art of any kind! 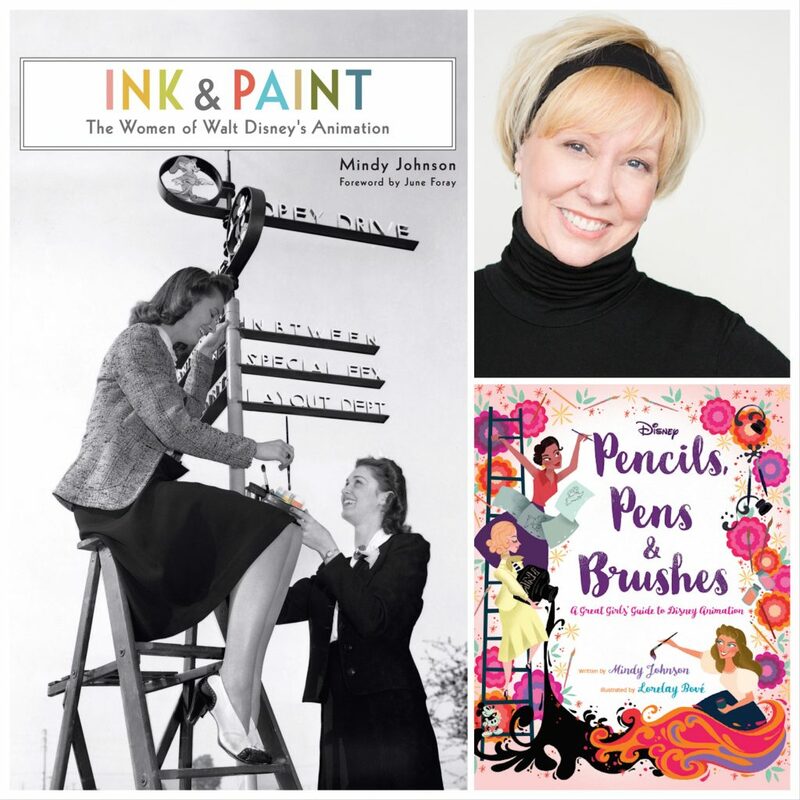 Also, stay tuned for an upcoming book by Mindy Johnson called Ink and Paint: The Women of Disney’s Animation Department! 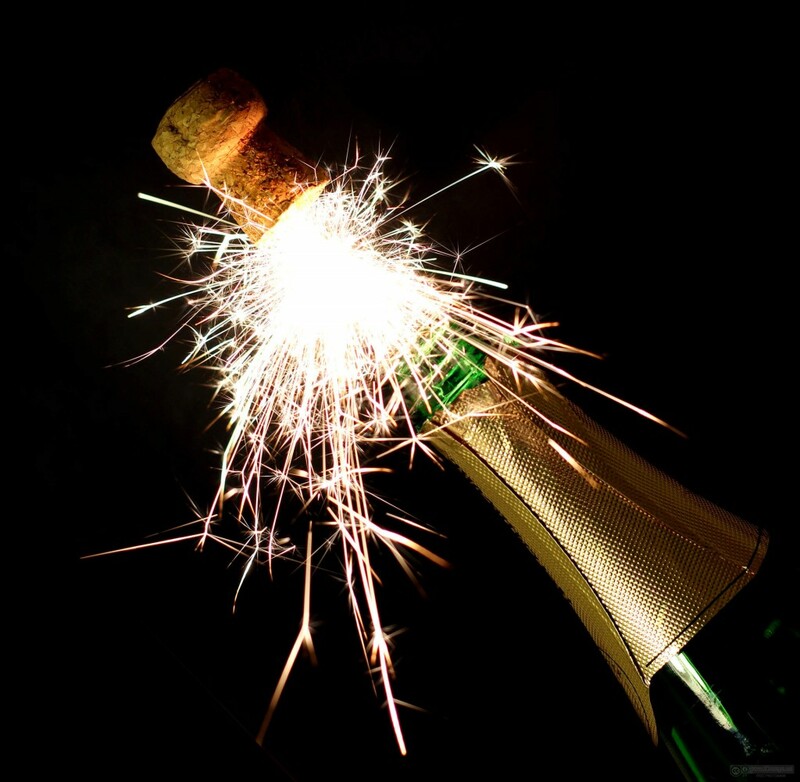 We hope your holidays were wonderful and that you are on your way to big things in 2015! We at ArtInsights certainly are.. This last year has seen some great art and great film releases, and some awesome directions for our favorite artists. Of course the first artist I’d mention is John Alvin, although of course since he passed away in 2008 it isn’t coming from John himself. But 2014 saw the release by Andrea Alvin, his partner and wife, of the book The Art of John Alvin, which got universally great reviews and made a fair number of best art books of 2014 lists. We loved seeing it at the top of Amazon UK, and all the press not only the book got, but John’s art as well. It seemed like every image he ever did for Jurassic Park crossed the internet! ars, and was an integral part to the creation of many well known posters of the 1980s and 90s, including the Batman advance and the Cape Fear posters. 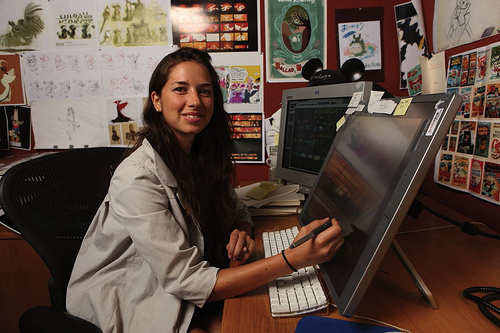 Most recently, however, she has been working with Disney and Warner Brothers creating official art for The Wizard of Oz anniversary and Looney Tunes, as well as images for Pixar and classic Disney characters. We love our collaboration with Tennessee Loveless, who is nearly done with his Ten x Ten x Ten series, which is getting more and more interesting while it maintains his edgy, of-the-moment pop aesthetic. You can see many explanations of the creations in the series HERE. 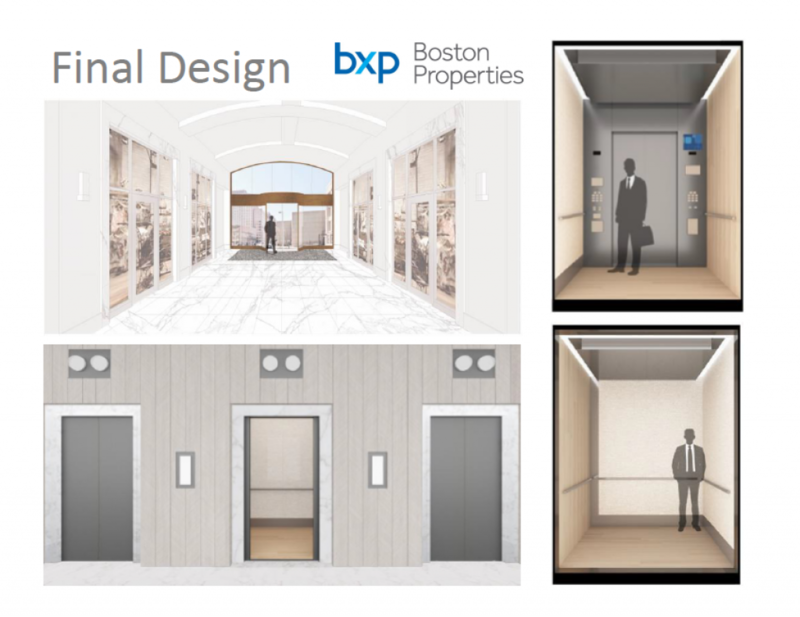 Look for some new exciting work we’ll be doing with him in 2015! There is no question his star continues to be on the rise, and there’s no telling just how far high he’ll go. If you like his work, now is the time to get connected to his fascinating world—one we love being a part of and believe you would too! Having Michelle St. Laurent was an absolute pleasure at the gallery this December. We still have several of her originals and they never cease to impress. So many layers, and so much integration of pop and traditional watercolor styles with illustration and animation—Toby Bluth would have loved it! 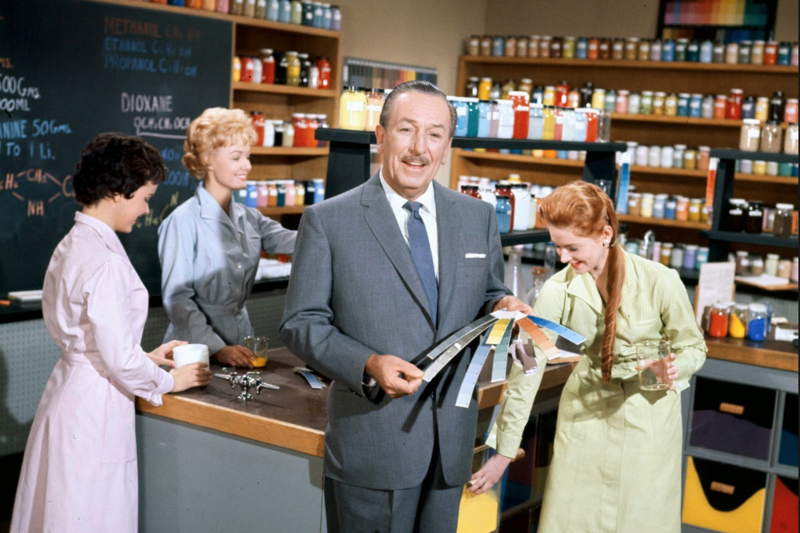 We learned Michelle was at the beginning of vinyl-mation, pin-trading, and ‘make your own ear hat” at Disney, and was behind a host of amazing environments at the parks. How wonderful to see a woman rise so high as an official artist in the studio! 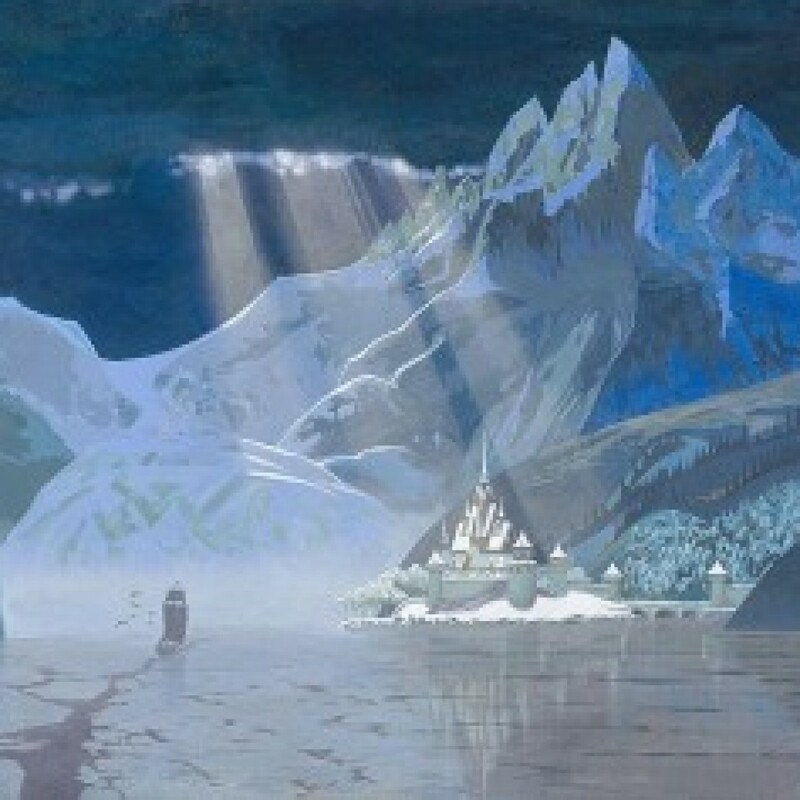 We haven’t had a chance to work with him yet, but very excited about the production designer from Disney’s Frozen, David Womersley, has become an official interpretive Disney fine artist! 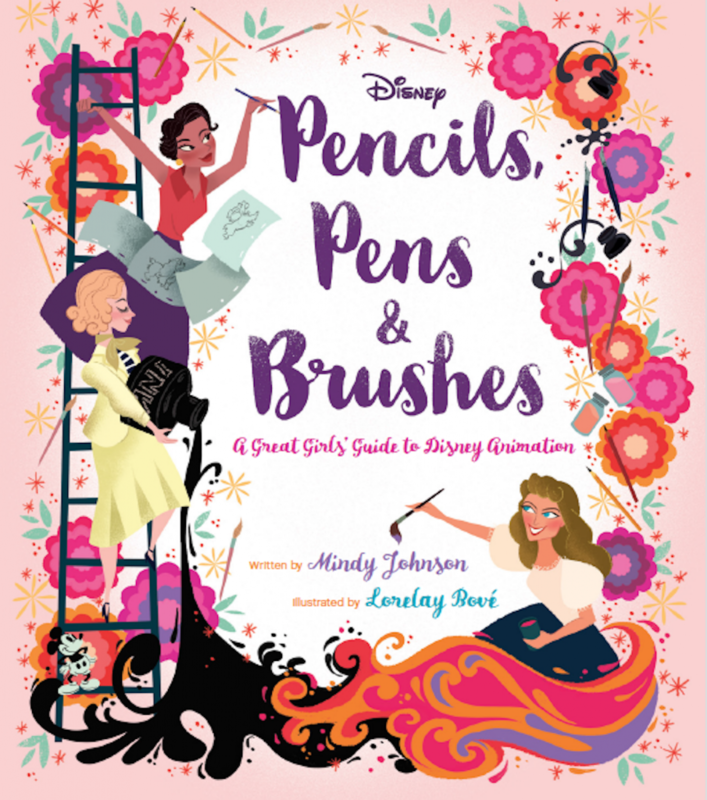 This is very cool for those who love collecting artists working inside the studios actually shaping their favorite movies…and it’s a BIG deal! I can’t wait to find people who will want to do a commission with him! 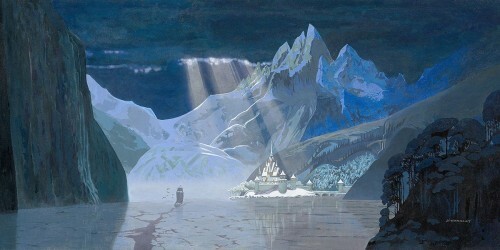 His first limited edition is based on two concept pieces he created to show the grandeur of the Norwegian landscape, and those pieces were instrumental in the finished design for the film. We look forward to interviewing him to let fans and collectors get to know him better! 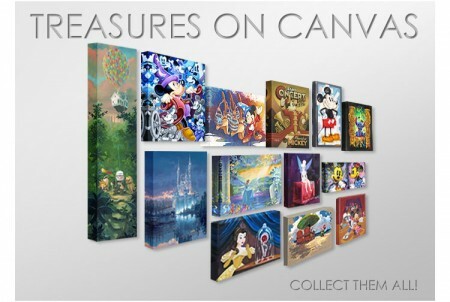 The best news for fans of Disney art with a limited budget is the new collection called “Treasures on Canvas”. It offers a variety of images that are also available in smaller editions that are hand embellished, in a larger edition size of 1500, gallery wrapped, and with a certificate of authenticity, all for only $125 each. What makes this so wonderful is when we first started representing animation art some 30 years ago, everyone could afford it. This collection makes it so again. We have actually sold several to young kids who bring us money every week, and it means they can collect their first piece of art. What a joy that has been! It is also true that the artists in the collection getting a wider audience, and as many of them are close friends I love, this too makes me happy! 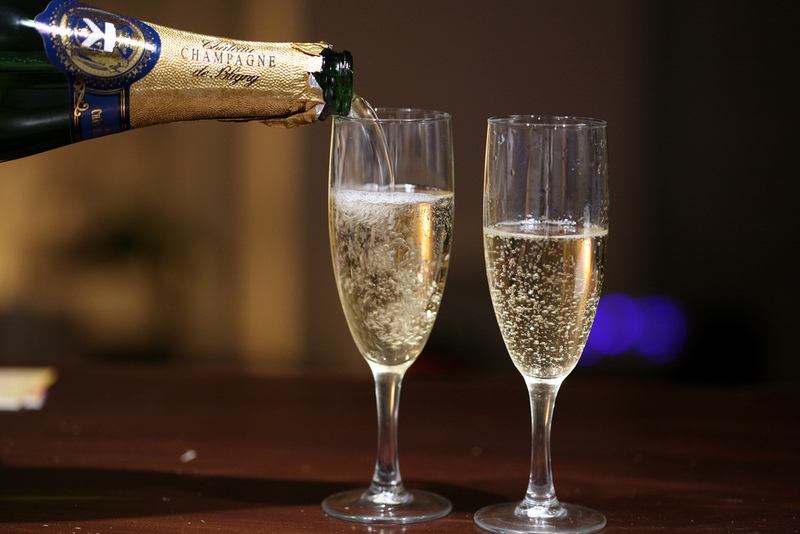 As to 2015, we look forward to some great changes and new offerings, which we can’t wait to announce. We have some new artists we know are set to skyrocket into the limelight, as well as properties we know our collectors are wanting to be released officially we are championing on their behalf. And in reference to that, if you are interested in a film having official art released, let us know and we’ll see what we can do! Trust us, we have your interests, and the success of film artists who should have greater notoriety for their work, in mind. 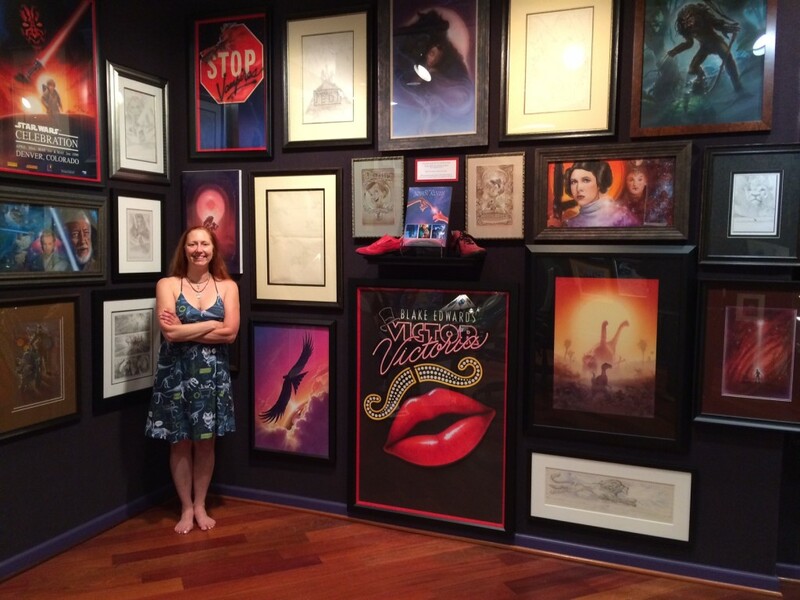 Traditional illustration and concept work deserves recognition, and we as a gallery advocate as much as possible. Here’s to 2015 expanding awareness of film art to the fine art collectors of the world, expanding acceptance of concept artists little known outside the studios, and expanding our collector base by our work in education and celebration of the art! There’s a Con-toddler in our midst. 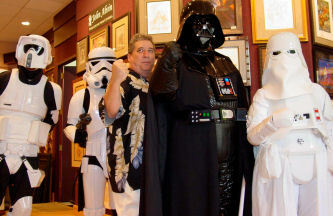 It’s the nearly brand spanking new convention in DC for enthusiasts of comics, movies, cartoons, and all things geeky. 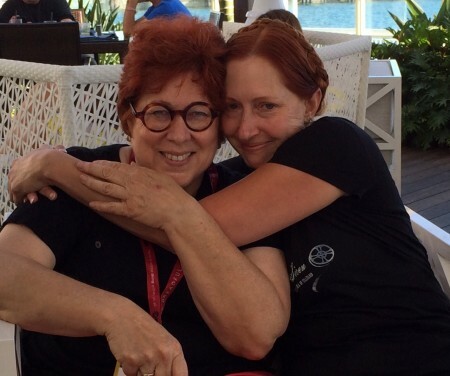 Not a moment too soon, I say… Last year we were at another convention the same weekend so we couldn’t take part. 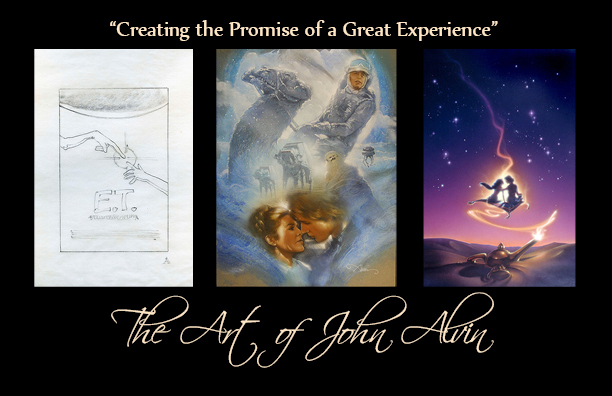 This year, however, with the shiny folk running the show, we are having our first con panel of the year, with guest Andrea Alvin of Alvin & Associates, John Alvin’s wife and artistic partner in ” The Art of John Alvin”. We are bringing some really rare original paintings created by John during his career, and it will be the first time we discuss the new book release, written by Andrea, about John and his amazing life as a film artist. 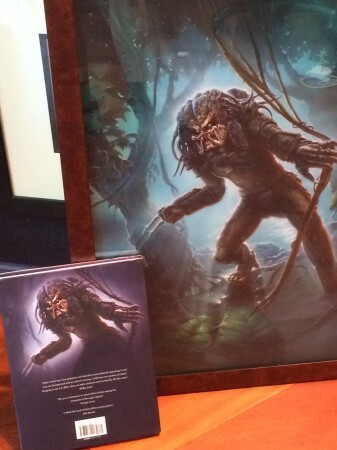 The book, which is being published through Titan Books, will have a preview release at San Diego Comic Con. It will be a wonderful presentation, not least to hear some of the great stories of how these posters came about, and get a better understanding of the immense contribution he made to the history of film. RON GLASS Saturday 10:30-11:30 (room 209C) Ron has had an amazing career in film and theater and it shows no sign of slowing down. I’m excited to talk to him about his life as an actor. JEWEL STAITE Saturday 12:00-1:00 (Room 202) Jewel is best known as Kaylee in Firefly, and Dr Jennifer Keller, but most recently was featured in The Killing. 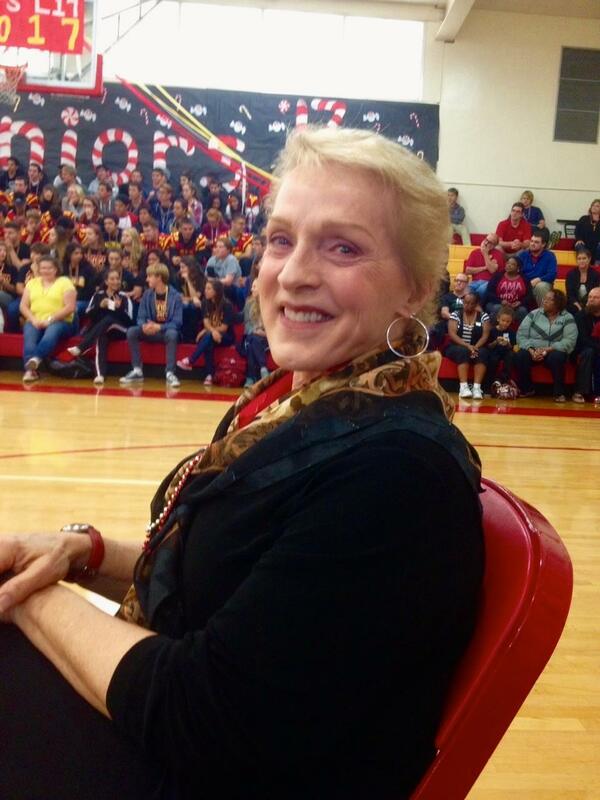 She’s a great guest and full of stories. NICHOLAS BRENDON Sunday 11:45-12:45 (room 207A) Nicholas played a great character as Xander in Buffy the Vampire Slayer and as Kevin Lynch actually made a wonderful match to Garcia in Criminal Minds. CARY ELWES Sunday 1:00-2:00 (room 202) Inconceivable? Nope. I’ll be asking the star about The Princess Bride, Robin Hood Men In Tights, The X-Files, Psych, and lots more. …like The Crush. Well, we’ll talk about whatever he wants. I hope you’ll come check out and support this new convention, even though it IS on Easter weekend–because it’s going to be a blast! I’ll report back about the Alvin panel, how I did in the Q&A’s, and the best tidbit I got out of each actor! Yup, I officially have the best job in the world–I can’t wait! 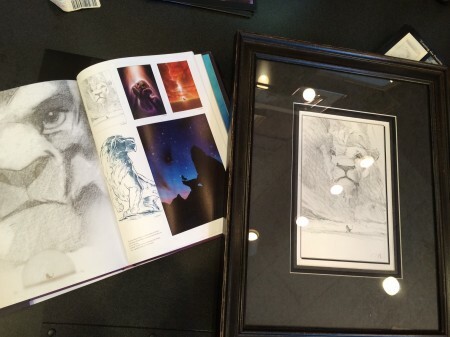 John Alvin Originals CAN BE FOUND AT THEIR OFFICIAL GALLERY HOME! please click here to go to this link! 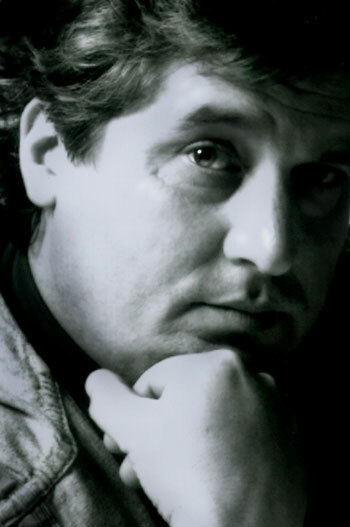 We at ArtInsights have been proud to be have known John Alvin and are honored to be connected as the official conduit from artist, through his family, to collector. 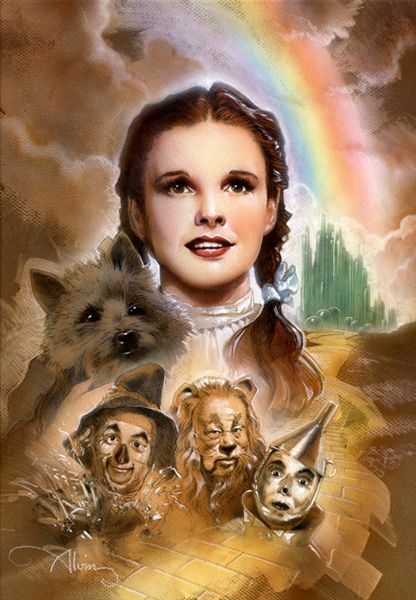 There is a special interaction inherent to the experience of collecting original art, and we believe when movie lovers can enjoy a piece of art by such a renown artist such as John Alvin from any movie on which he created images, they become part of celebrating the important aspect of film history that campaign art represents. Collecting posters is a wonderful thing, but having a piece of art used in the making of the poster is something those who have begun a collection of such can tell you is a truly joyful experience. 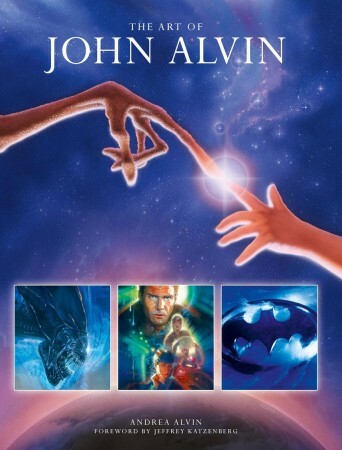 John Alvin was a lovely man, humble, warm, and kind, who always had time for his fans and blossoming artists. 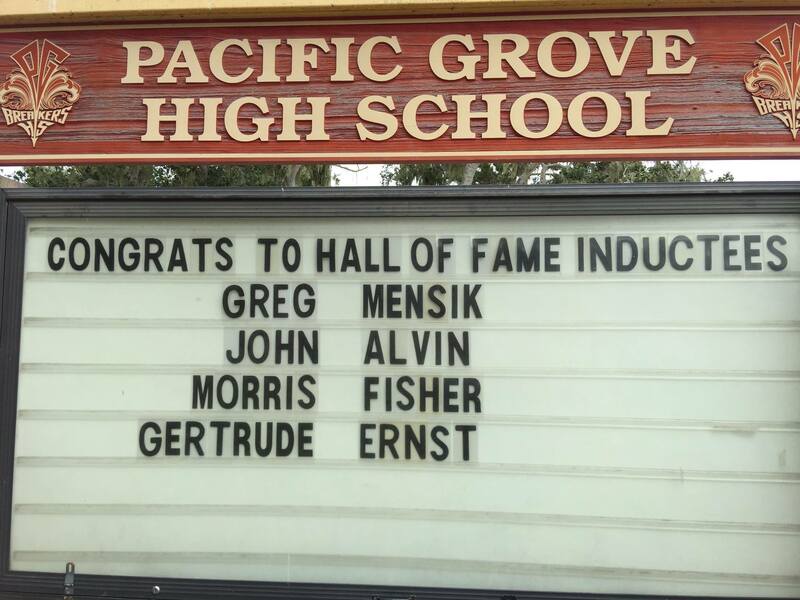 We miss him and are thrilled The Art of John Alvin will create new fans and increase awareness about him throughout the world. 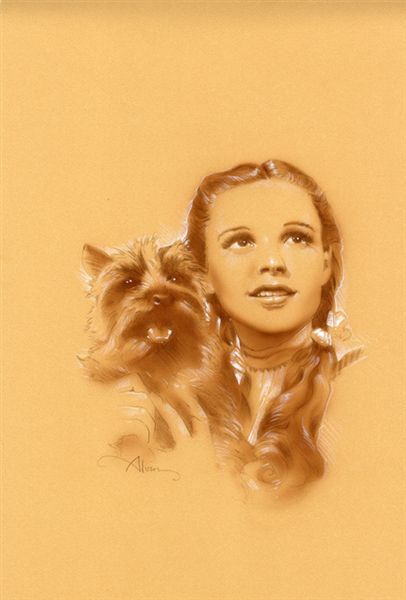 We hope if you are in the Washington DC area or would like to see a collection of original art by John Alvin you’ll come to our gallery where you can see them in person. Thanks for your interest!